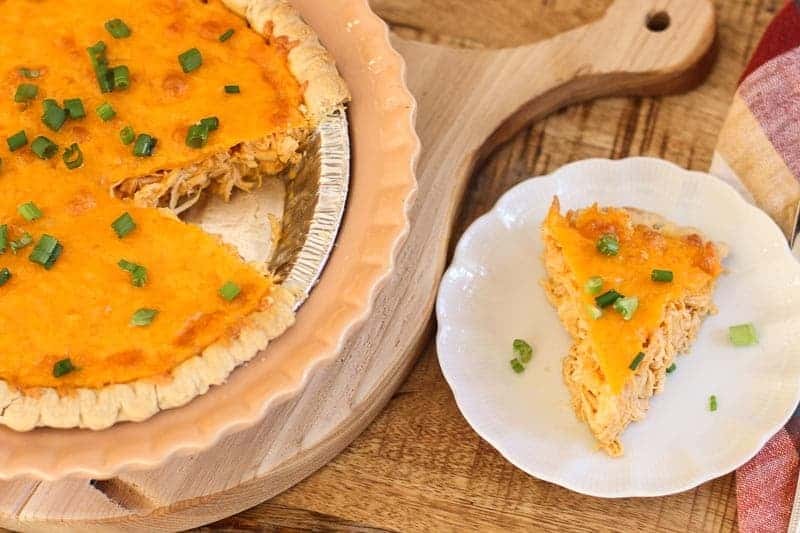 Learn how to make this Easy Cheesy Buffalo Chicken Pie. This easy chicken pot pie recipe is so delicious. The tasty flavors of traditional buffalo wings are combined with ranch and cheese. 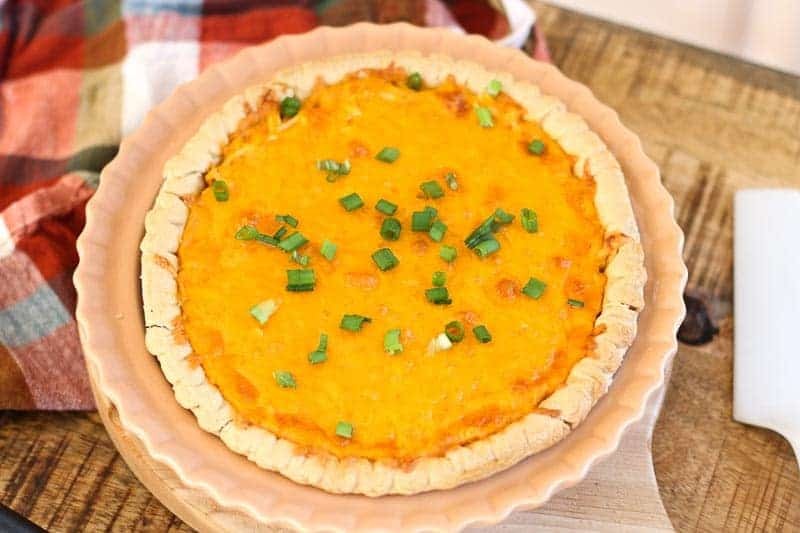 The end result is a cheesy buffalo chicken pie in a flaky crust. It can be served as an entree or an appetizer. Our family loves buffalo chicken. I have a fantastic Grilled Buffalo Wings and a tasty Instant Pot Shredded Buffalo Chicken recipe. 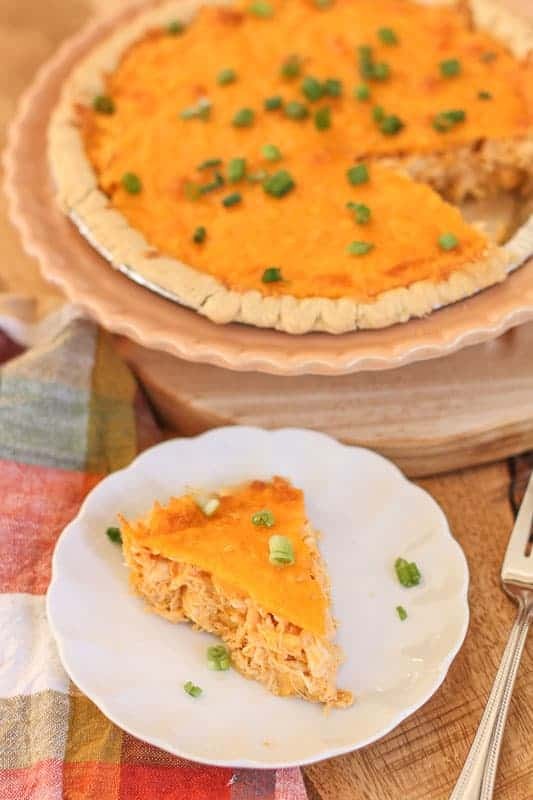 Because we love buffalo chicken, my sister-in-law, Melanie Crenshaw made this incredibly delectable buffalo chicken pie. 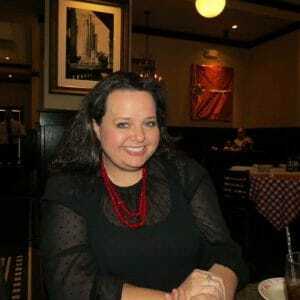 She is an amazing baker and is always making yummy treats for us. This cheesy chicken pie was soooooo Tasty! The addition of ranch and cheese really makes it. 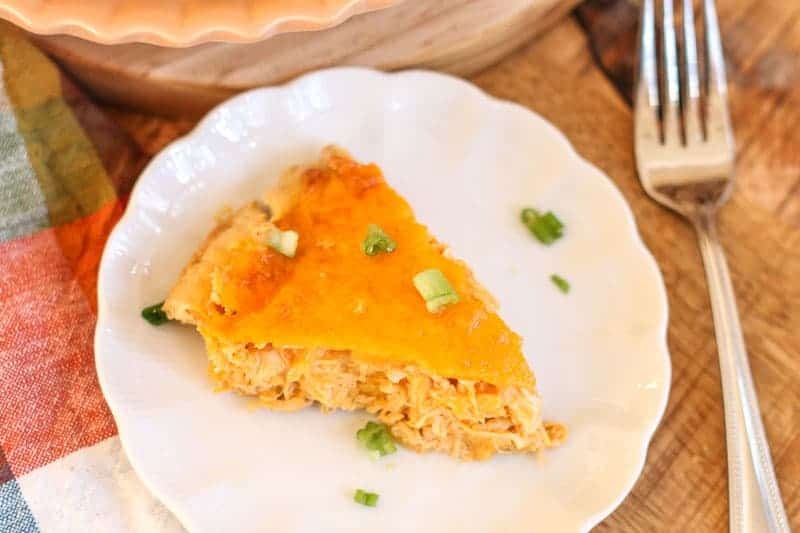 The chicken is tender and flavorful on the inside, the crust is flaky and mildly sweet, and the cheese topping pulls it all together. BRILLIANT! This 5 ingredients recipe makes an easy chicken pot pie! We use Frank’sBuffalo Wing Sauce, but you can use whatever buffalo wing sauce you prefer. We also use a pre-made frozen pie crust. Check out this homemade pie crust recipe if you prefer to make one yourself. This easy easy chicken pot pie recipe is so delicious. The tasty flavors of traditional buffalo wings are combined with ranch and cheese. The end result is a cheesy buffalo chicken pie in a flaky crust. It can be served as an entree or an appetizer. Cook pie shell for 10 minutes. Remove from oven. In a mixing bowl, mix shredded chicken, 1/2 of grated cheese, and ranch dressing, and wing sauce. Add mixture to the pie shell. Return the pie to the oven and bake an additional 15 to 20 minutes or until cheese topping is fully melted. Rest 5 minutes and serve. Buffalo chicken wings are one of my favorite appetizers. I love the idea of that flavor in a chicken pot pie. Very creative. Yummy! What a delicious chicken pie, I can’t wait to try and making it, my family will devour it in minutes! Sounds like the perfect way to enjoy the flavors of buffalo chicken in a bit less messy a way. I love buffalo anything. Looks great. Holy cow! My son will go crazy for this one! He is huge Buffalo chicken fan! Definitely giving this a go! I’m guessing you add the Buffalo sauce when you add the ranch dressing, right? I plan on trying this soon.